Observation - miked's 279th spot submitted on 28th September 2009 - UK and Ireland. 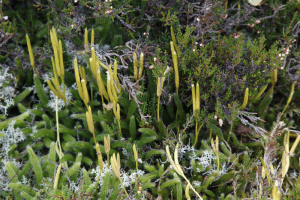 Description: The clubmoss was releasing its spores in the gale, had lugged video up mountain but forgot to get footage of the clouds coming out of the cones! The clubmoss was releasing its spores in the gale, had lugged video up mountain but forgot to get footage of the clouds coming out of the cones!